This weekend, my buddy, Coco, celebrated her birthday, a relatively innocuous one since this year’s ended in a three, not a digit from the trinity of dread — zero, five or nine. We settled on a plan to meet at 6:30 at an Italian restaurant we frequent in Greenwich Village. This gave me time to run a quick errand before hooking up with my pal. When I returned to my sanctum sanctorum to pick up Coco’s birthday gift* and head downtown, I noticed that The Trash Phantom had visited my building while I was out. The Trash Phantom is That Wily One that leaves junk prominently displayed within close proximity of the trashcans without putting said junk actually inside the trashcans. The Trash Phantom must deem this junk as having value to some schnook passing by in this neighborhood, where the average resident earns $80k. I do not earn anywhere near $80k, but I also have standards and an immense fear of athlete’s foot. 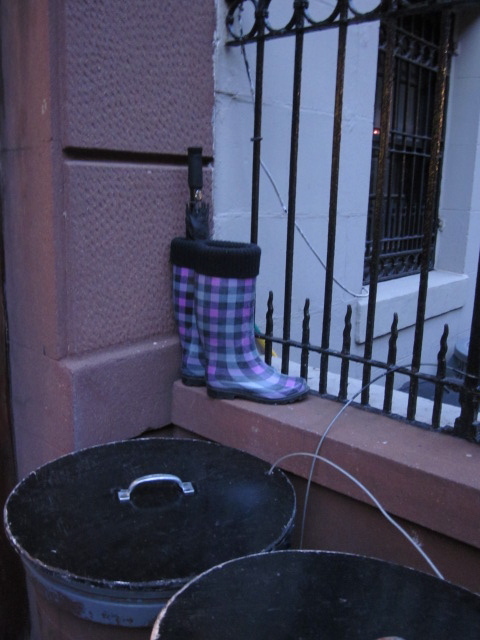 Therefore, this pair of purple plaid rain boots from The Eyesore Collection stuffed with an umbrella near my building’s trashcans had zero appeal to me. Eyesore Collection Rain Boots. Look for them in the finest neighborhoods on Manhattan's Upper West Side. Considering the massive bedbug scare that plagued Gotham City in 2010, I’m very skittish about most junk I see on the street. Yet, I suppose if it was a pillowcase stuffed with gold doubloon, my skittishness would instantly evaporate and I could easily access my inner pirate. Regular readers of Lame Adventures, all three of you, may also recall that The Trash Phantoms have left outside my Casa de la Shangri-La fedoras, office furniture, and my personal favorite, an odd looking stuffed fish that reminded me of a tennis ball, possibly because when it was put out for grabs the timing coincided with the US Open tennis tournament and I had tennis on the brain. 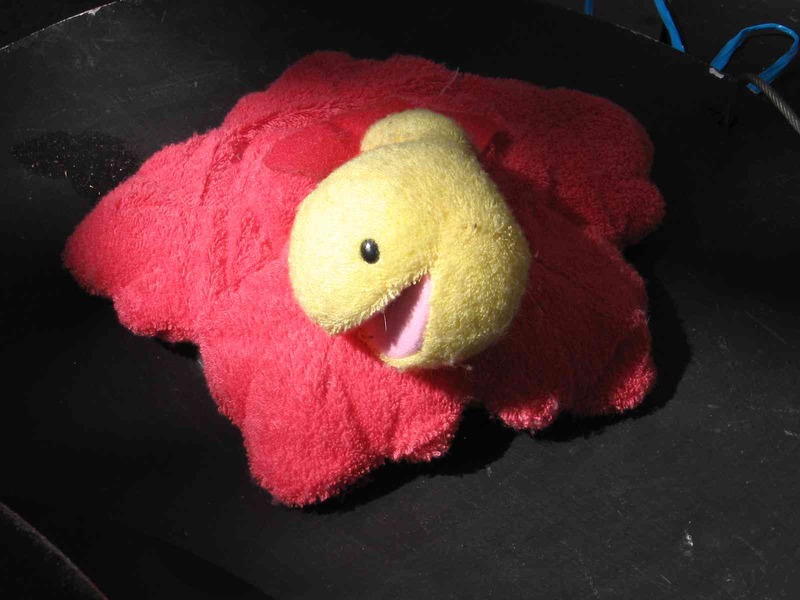 Back by no demand, odd looking stuffed fish that reminded me of a tennis ball. As usual, I wondered about the mentality of someone that would leave a pair of rain boots and an umbrella out for the taking. Did this person think they were being altruistic, were they ambivalent about chucking rain boots that they knew were still in decent or possibly never worn condition, or were they someone with such advanced attention deficit disorder, they were distracted by a low flying sparrow, and completely blanked on their intended task, dumping the rain boots in the trash? 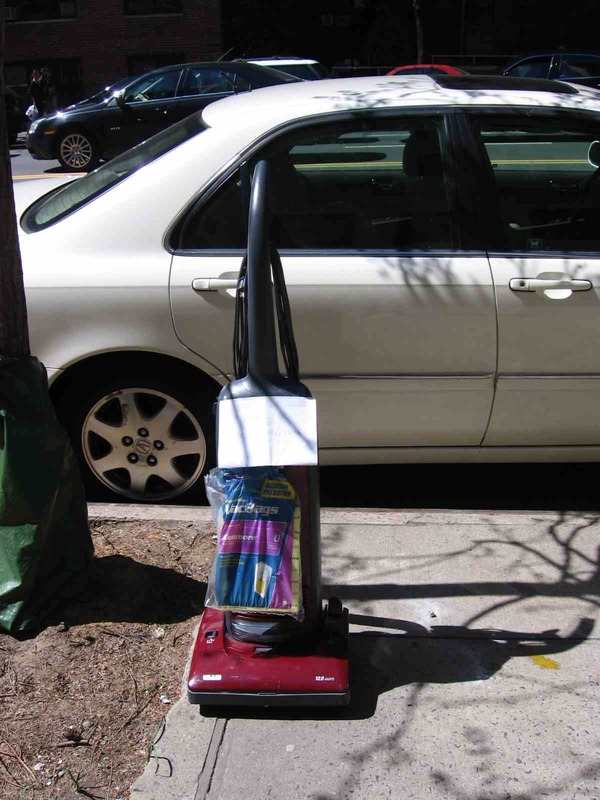 A few years ago a Trash Phantom left a vacuum cleaner out on West End Avenue. They attached this note that I thought was responsible. Umbrella – like new. Rain boots. Woman’s size [whatever]. Never Worn. Have strong purple plaid aversion. Please rescue. 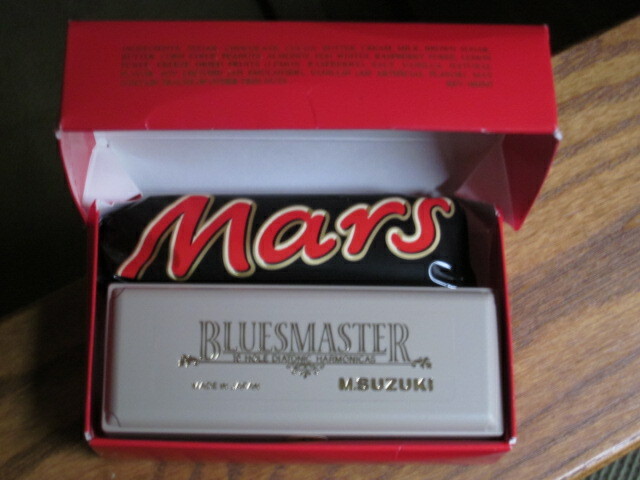 *Coco’s practical birthday gift from me — a harmonica and a Mars candy bar – obvious useful objects my fashionista cohort would never think to give herself. Perfect for the woman that loves Chanel. 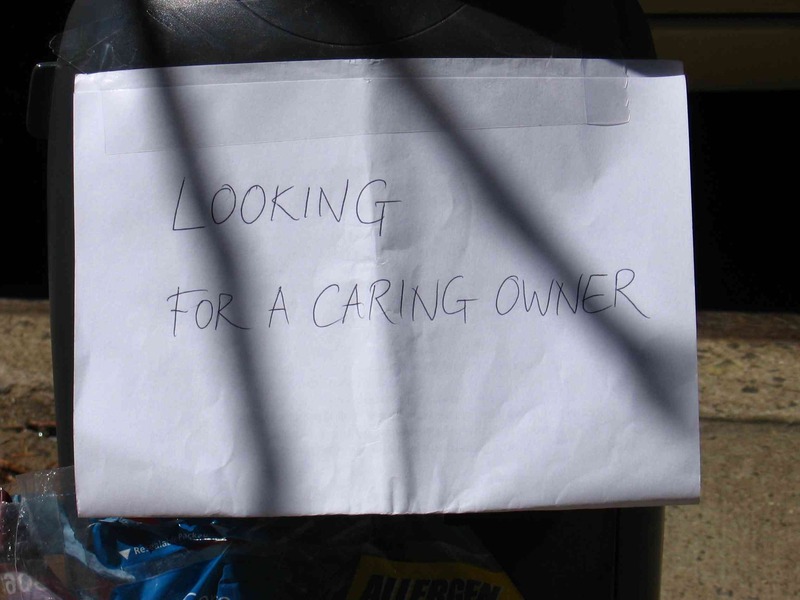 This entry was posted in Humor, new york city and tagged candy, garbage, harmonica, junk, mars bar, rain boots, trash, Upper West Side. Bookmark the permalink. Great fun; thanks again for bringing me to town. The blues harp – a most excellent gift! And the Mars bar provides a source of quick energy for after that jam! I’m glad it’s been awarded your seal of approval, Django, but it’s a Suzuki — not a Hohner! The guy in the music store insisted that Hohner is the name brand but Suzuki is better. I had just missed out on buying the last Hohner in my price range in the key of C because, like an idiot, I grabbed the subway going in the wrong direction. Everything I do ends up a Lame Adventure. Coco did seem pleased with it, and this was before she downed a super tanker of red wine and a few shots. Okay–prepare to cringe. I give you fair warning. However, I’ve gotten some of my best stuff out of the trash–two dressers that have been refinished–a window ac unit, etc. Admittedly, I worked hard to convince Sara that this scavenging paid off–but now she, too, believes. At the same time, I don’t live in NYC. I might be more trash-phobic in your neck of the woods. Have you heard of this whole movement of folks living off of stuff scavenged from dumpsters? I think they are called Freegans. Possibly the trash you encounter is a tad more refined and less germ & vermin-infused than what’s lying around Gotham City. I recall your extreme makeover of that table you found. We do have a fair share of Freegans out here, but we call them Homeless. Always good to hear from you K! I share your aversion to Street Treasures (hey! that could also be a name for prostitutes)- however, my daughter does not and has scavenged items- and I cringe when I think of her doing that….I recently helped her move up in Seattle- we did not keep good stuff separate out of the dumpster- was so rainy and cold- found a fellow, very polite, going through her discarded clothes…figure he will look nice in her abandoned black skirt…. Street Treasures — indeed what an excellent name for hustlers! Glad to hear that your daughter made the skirt loving bloke happy, Tracy. It was an awesome black lacy little number…second hand and now third…so- not a McIntyre Tile heart in Valentine Blog today?? Glad to know you’re a crossdresser’s advocate. That’s a mystery tile.